I didn’t really expect to wake up last night at 4AM in the morning to the feeling of sheer cold. I was sleeping in a room in the basement of our host family’s home. Apparently the heater got turned off at some point and t-shirt and shorts were a terrible idea, even with my supposedly “cold weather” sleeping bag. I toughed it out though, and even went ahead and put on my Under Armour thermals because…well…I have them. Builds character and preparation. 6:30AM rolls around, and being up and about was refreshing because it got my body moving to warm up a little. The cool thing about waking up this morning despite overcoming the lack of heat was to see the aftermath of the previous nights’ snow fall. 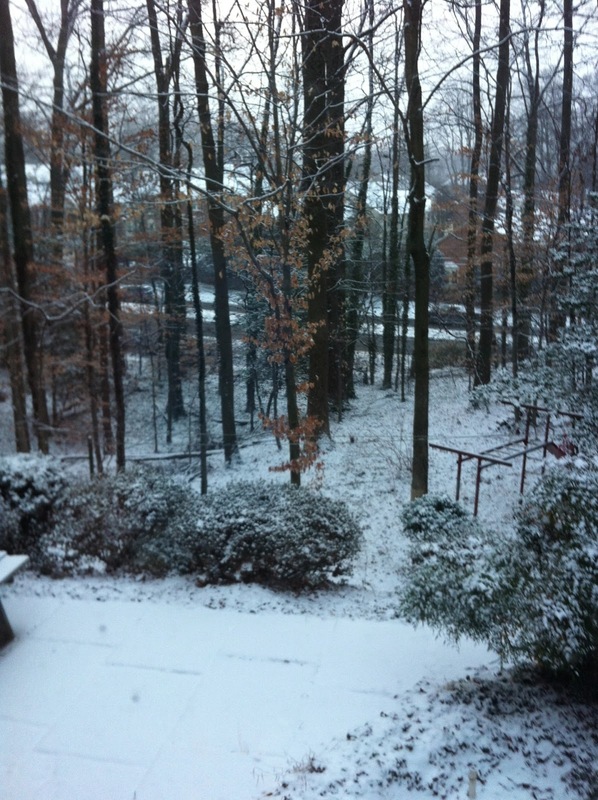 I looked out the window, and it was beautiful to see a healthy blanket of snow cover the ground. After a quick breakfast, my group at that particular host family’s home headed out to the Metro station. I spent nearly an hour and a half outside of the Metro station because we waited for the rest of our group to arrive from their respective host families’ houses. I definitely appreciated the functioning use of the main zipper on my jacket. And gloves. And scarf. And UA thermals. And beanie. And second jacket. And hoodie. It was cold. 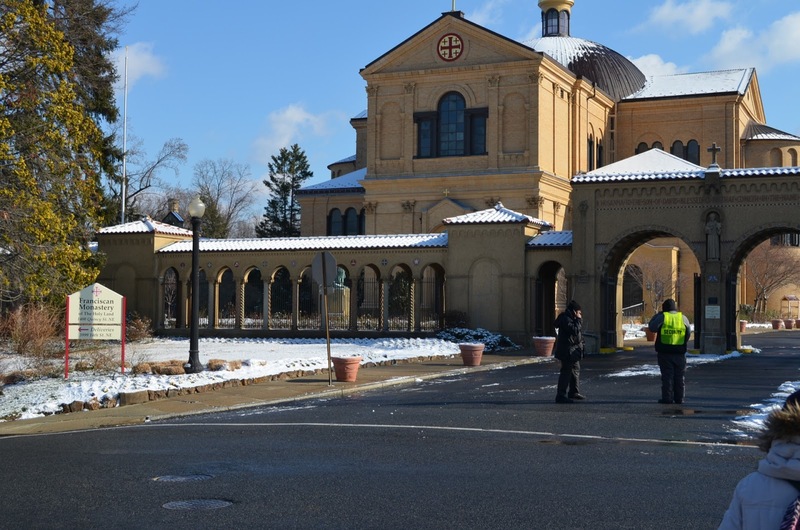 Our first event today was to go visit the Franciscan Monastery of the Holy Land just north of Washington, DC. We took the Metro rail, with some rail switching, to get there. Mass transit is definitely not a Texan thing, and I felt like such a tourist not knowing what to do and carrying my camera, but eventually we all made it to the Monastery with a lot of brisk (literally) walking. We arrived right at 11AM, which is when the Monastery starts their tours. Upon walking in, I noticed a familiar Franciscan Friar of the Renewal, Fr. Luke. Last time I saw him was at Youth 2000! I don’t know why he was there, but he was and I couldn’t NOT say hi. One of the tour guide monks took us around the interior of the Monastery. I’m not gonna lie, I was in awe of the beauty of the art/architecture of the Monastery because it was pretty big and had so much to look at, but in a reverent sort of way. In other words, the art/images/architecture focused and lifted my mind towards God. If I remember correctly, this body is from the early centuries. Like, 100’s or 200’s. During this time, there was a lot of Roman persecution of Christians. This child had died in those persecutions and the body found centuries later. What’s remarkable is that St. Innocent’s body was found preserved between the bodies of a male and female, supposedly the parents. The face you see in the picture is a wax mask, but the hands and feet are not covered. 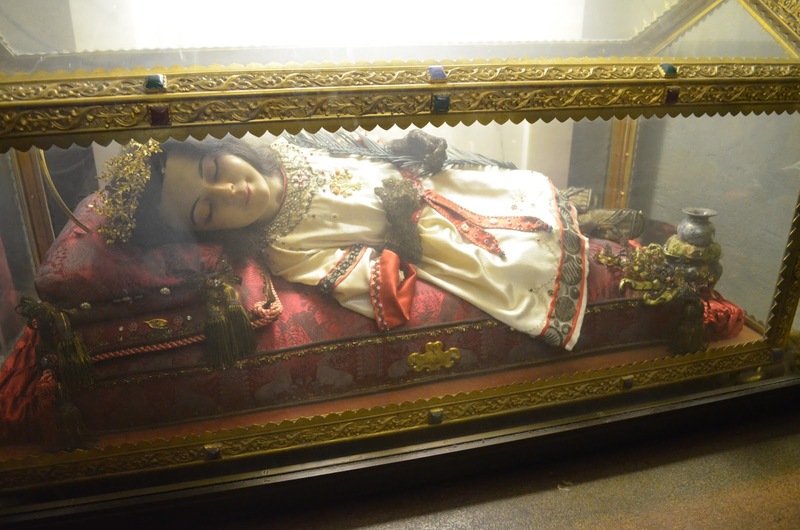 Some other cool moments were seeing the bones of another saint (I forget who), going upstairs and looking at those altars and seeing the churchy part from a high point of view, seeing replicas of things that are in the actual Holy Land of the Sepulchre Church. The night before, we packed sack lunches to bring with us as we’re out and about while we’re going around Washington, DC. The tour director seemed to like my group a lot that she granted special privileges in utilizing a classroom so that my group could eat lunch–she normally doesn’t do that. That was pretty cool. During lunch I received a text from a friend back home, and she mentioned how one of her friends was scheduled to have an abortion at some point during the day. My friend requested prayers, but I made the announcement to our whole group and thus all 35 of us were able to offer up our prayers for a change of heart. The Monastery has a pretty cool gift shop, and it was neat to see all the Catholic things you can buy. I just looked around without buying anything. With the help of a friend, I started sniffing wafting incense (lol that sounds like I’m doing drugs (but I’m really not (but it’s sweet-smelling incense for liturgy and other special occasions))). After visiting the Monastery, we went down the street a bit to visit the Poor Clares of Perpetual Adoration. 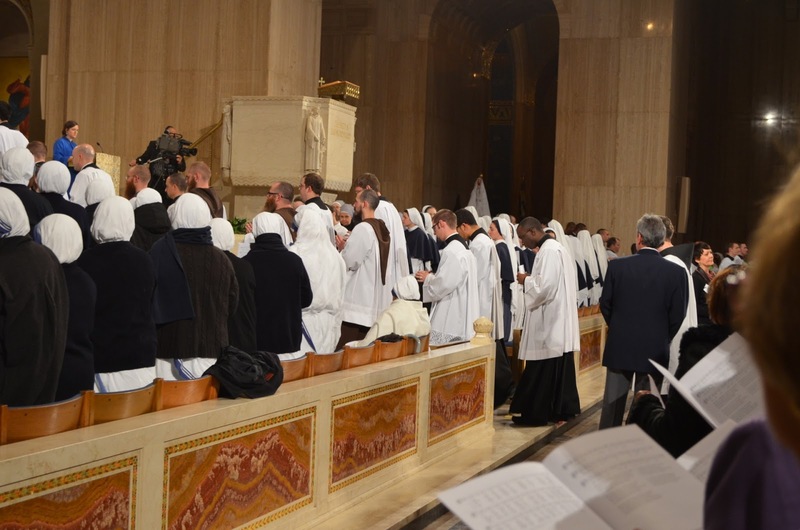 They are a community of nuns who, literally, adore Christ in the Eucharist. All. The. Time. (in continuous shifts). Because of the smallness of the chapel and our large group, we divided ourselves in half and did holy half-hours. Since I was part of the half who did’t go first to Adoration, we went a few houses down to an icon shop. This place was pretty cool, too! Being such a “westerner” in the Church, I’ve not really been exposed to the sights and sounds of our Church’s “eastern” flavor. It’s a really small gift shop packed with icons of saints, eastern-style sacramentals, books, and a whole bunch of other little things. I wafted more incense. After spending some time browsing, we went back to the Poor Clares for our turn in Adoration. Adoration is simply the adoring of Jesus Christ, truly present in the Eucharist: body, blood, soul, and divinity. How blessed we are as Catholics to have Jesus present in our chapels! 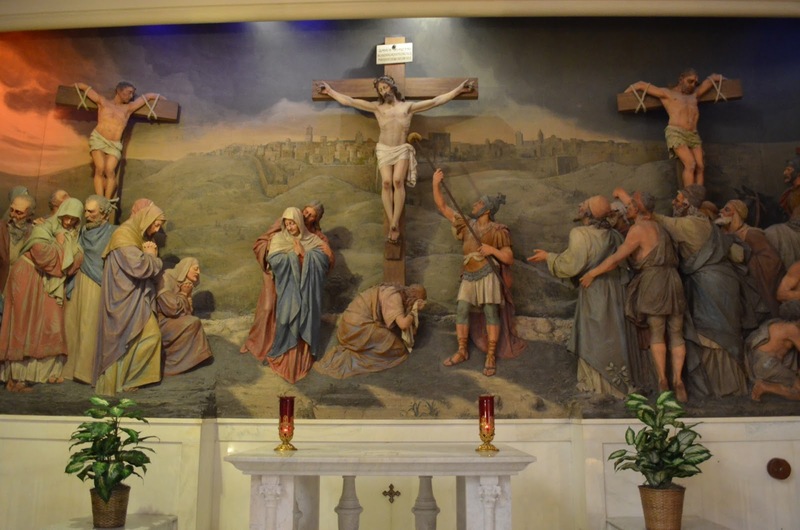 And we had the beautiful opportunity to adore Christ at the Poor Clare’s. I don’t know much about them, but they have someone adoring Christ all. the. time. During my time before Jesus, I couldn’t help but offer prayers for my friend’s friend scheduled to have an abortion. I couldn’t help but to pray for us on this pilgrimage. Annnd, I couldn’t help but offer prayers for a change of heart in our country regarding the dignity of human life, especially from conception to birth. Haha, so…a #Disclaimer: I attempted at writing some of these blog posts really, really late at night during our trip, and I couldn’t complete them because I hit Great Walls of Tiredness. Fortunately, before going to bed, I provided myself a bulleted list of other things that happened that day that I didn’t have the energy to continue typing about. After Adoration, we walked over the Catholic University of America nearby. Why? 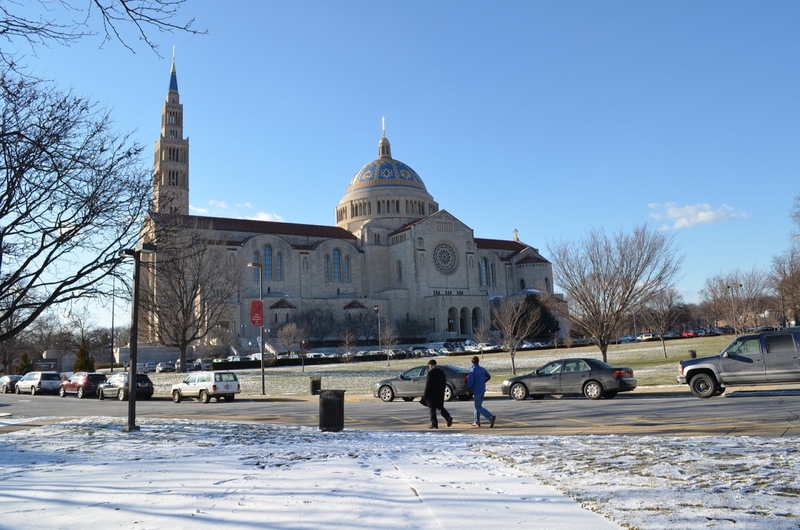 Because right next to CUA is the Basilica of the National Shrine of the Immaculate Conception! 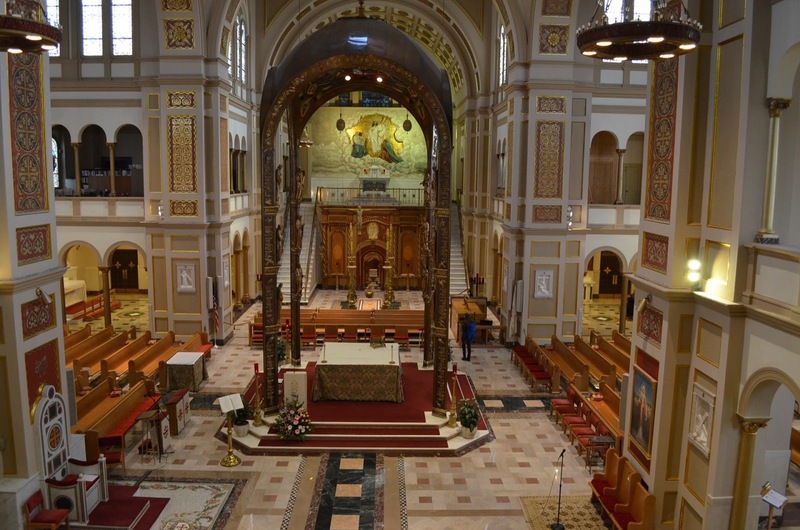 It is the largest Catholic church in the United States and North America, and it is also one of the ten biggest in the world. No big deal. 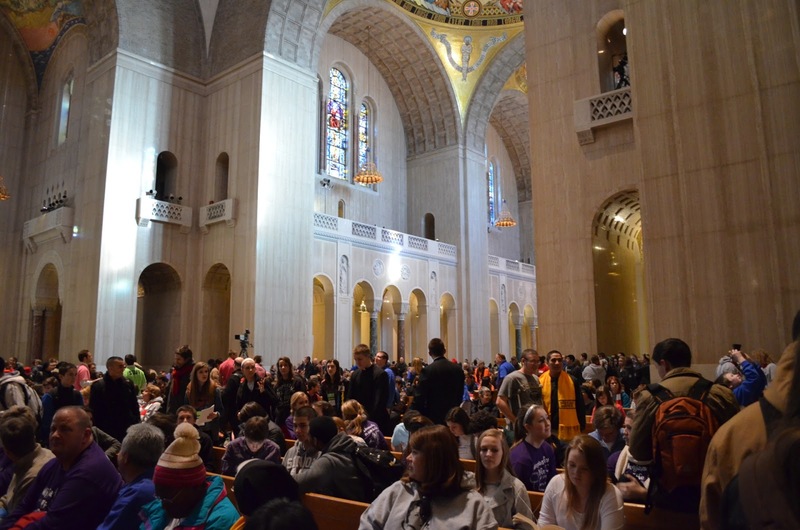 The Vigil Mass for the March For Life was scheduled to start at 6:30PM that Thursday evening. Lol, we arrived 3 hours early! Walking in, it was already fairly crowded. 3 hours before Mass. Not pictured is how every chapel in the side alcoves is filled with people. By some grace of God, we were able to nab some pretty awesome space (not pews) in the aisles right up at the front. 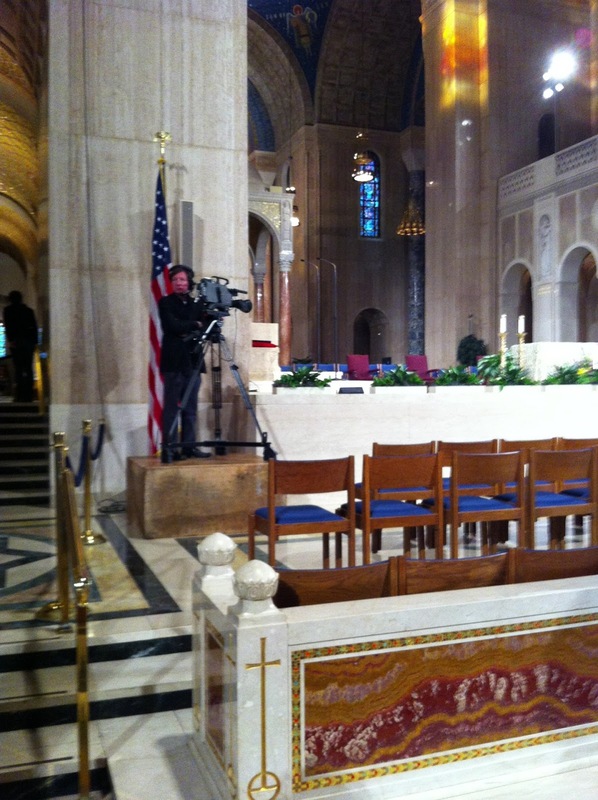 My vantage point–left side of front left-from-center-aisle pew. Oh hey, EWTN is here! It didn’t take long for the other remaining aisle spaces to be filled up with people. Why am I making this a big deal? Because I’ve heard him interviewed on Catholic Answers Live talking about his website, Grace Before Meals, and some of the cookbooks he’s written. His whole thing is using the preparation and consuming of meals to bring closer together families and married couples. Also, he totally won a cooking challenge against Bobby Flay in a steak fajita cookoff on Food Network. Oh, and he’s Filipino. Ahem, anyway… probably like…an hour before Mass started I walked around the rest of the Basilica. By then, it was really hard to go anywhere. The Basilica is so ridiculously huge to me for a church…and what blew me away was how much there was underneath the “upstairs” church! Also on the lower level are a cafeteria, two gift shops, a completely different church underneath called the “crypt church”, and even more chapels dedicated to Mary. The areas below were also rather crowded with people waiting for Mass to start–there was such a Ba-silly-ca amount of people…EVERYWHERE! I ran into a Fightin’ Texas Aggie in my successful finding of the Men’s Restroom that had a very, very long line. Yeah, I decided to keep moving on and hold it. Builds character. I also accidentally came across a very quiet area downstairs in the “crypt level.” I had unknowingly walked into the area where they were holding Confessions. Awkward. Luckily, I didn’t overhear anything. With about 30 minutes left, I headed back up to my spot in the upstairs church. That was quite a task zig-zagging through my fellow Catholics because many, many more had gathered for the Vigil Mass. I finally made it! And it wasn’t too long before Mass started. Upon returning, I noticed that the front seats had been taken up by several different groups of religious sisters. I recognized, closest to me, the Missionaries of Charity, the religious community started by Blessed Mother Teresa. 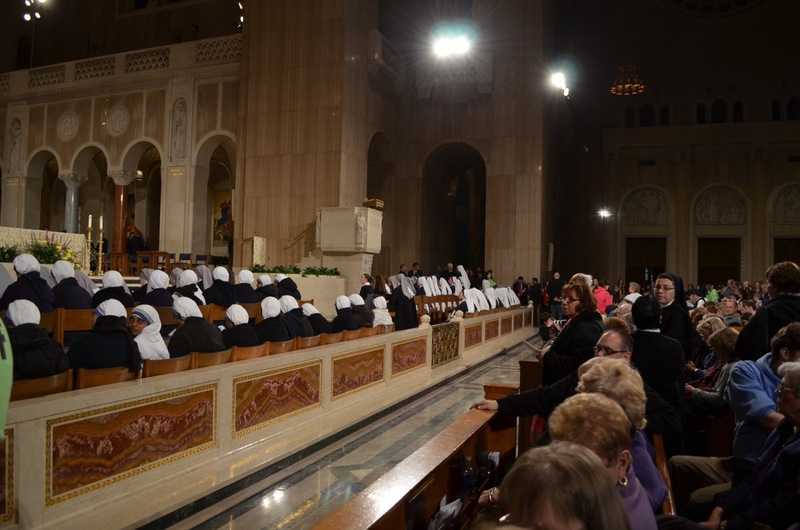 I also recognized the Sisters of Life across the way, of whom I’ve met and befriended two sisters at a previous Catholic event. So, typically at the beginning of a Catholic Mass, the priest and his helpers process (as in, march) in before they take their places up on the altar. Usually that doesn’t take that long–a few minutes. But…since this Vigil Mass is kind of a big deal and meant for all gathered for the March For Life, the procession took a really long time. 40 minutes. I timed it using the Clock app on my iPhone! About 22 minutes for all the seminarians to process in, 10 or so mins for deacons, about 5 minutes for the priests, and another 5 minutes for the bishops and cardinals. I got to see our former Bishop process in as well as Cardinal Dolan! No big deal. We had 6 cardinals con-celebrating this Mass with Cardinal O’Malley of the Archdiocese of Boston giving the homily. I really liked Cardinal O’Malley’s homily because it really illustrated the things we face in terms of offenses against human life, and briefly, religious liberty. One quote that stuck out to me was, “A nation that allows parents to kill their children will allow children to kill their parents.” This was in reference to abortion and euthanasia, and…that’s worth a reflection blog post on its own. I have to say, Communion was organized chaos. Praise God that there were many, many Ordinary and Extraordinary Ministers of Holy Communion (about 40 minutes procession’s worth!) to give the Body of Christ to the faithful. But with the church being so crowded, it was tricky. I lost my spot for a good 10-15 minutes before I awkwardly got it back (since I got displaced going through the Communion line). 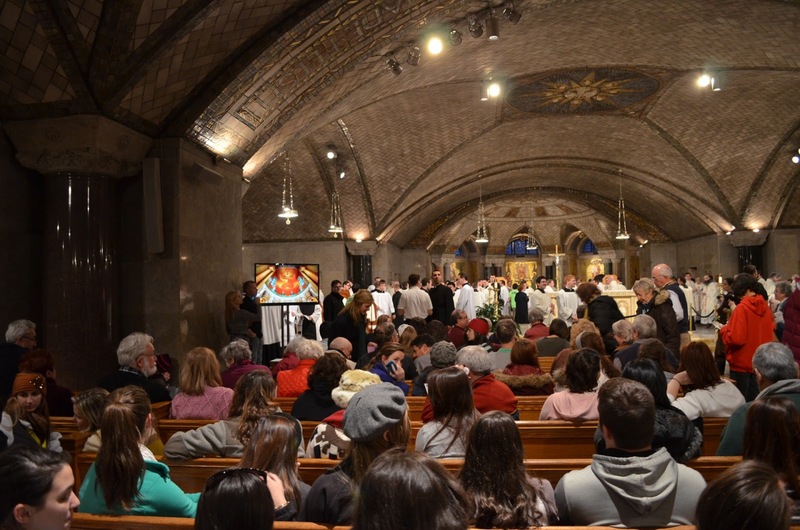 After the Vigil Mass, my group went downstairs to the crypt level in one of the chapels to meet up with our diocesan group for a very cool opportunity. 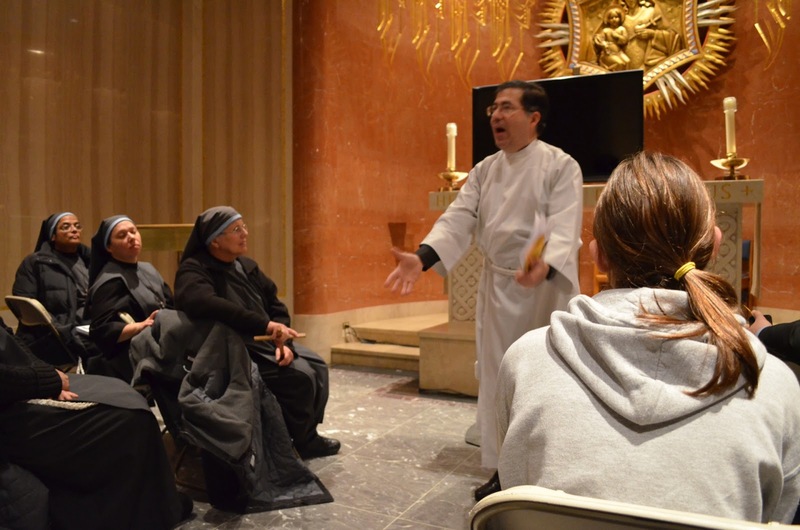 We had the special privilege of having a semi-private audience with Fr. Frank Pavone, director of Priests for Life. 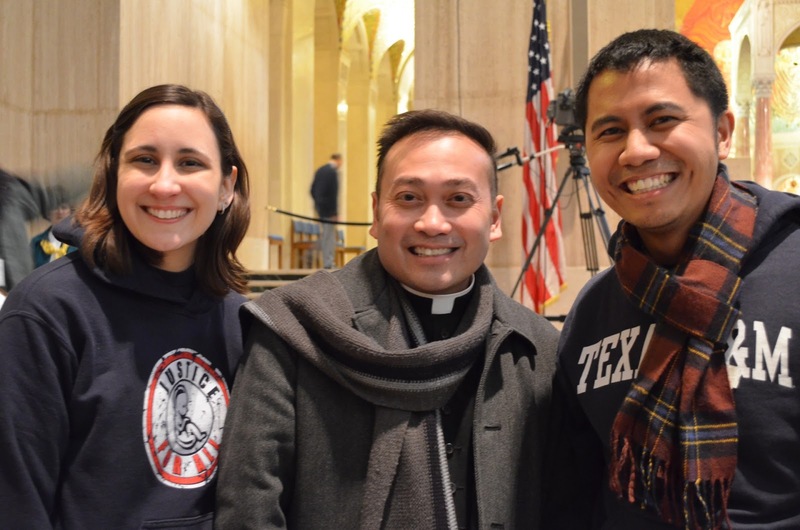 He led us in a night prayer, and gave some motivating words for the pro-life cause. Also present were some religious sisters from Amarillo, TX. That was pretty cool and I found myself motivated to do more for the pro-life movement after hearing Fr. Frank Pavone. Or rather, doing more of what I’m already doing but with more concentrated effort. The last thing that happened at the Basilica is that one of the guys in my group was on a desperate mission to get his Benedictine cross blessed by a Benedictine. You can get religious items blessed by any Catholic priest, but Benedictine priests also say an exorcism prayer when blessing religious items (though I need to research this more as to why…). I was actually kind of annoyed because I hadn’t eaten my sack dinner yet, and I wasn’t confident that we’d find one so easily. So, I joined in the quest with hesitation–to find a Benedictine! Dinner had to wait. And yes! Oh me, of little faith! There was totally a Benedictine priest chilling behind a statue in the lobby talking on his iPhone! Ask’d and receive’d! He gladly blessed my companion’s cross and used his iPhone to read the necessary prayers. I also thought it cool that the holy water used to bless the cross was housed in a contact lens case. Small and portable, eh? After returning back to our group after a successful Benedictine blessing quest, we headed out of the Basilica and back on the Metro. For whatever reason, people in our group decided to break out into song on the way to the Metro and the singing continued at the platform. It got crazy enough that our group gained the attention of a group of seminarians also on the platform. They actually came over and decided to join in on the singing and hand-motioning–and it was very much a Catholic party. Not gonna lie, that was one of the major highlights of the night for a lot of us–hanging out with the seminarians and singing the Salve Regina so beautifully on the train. They had to leave at an earlier stop than us, but after they left, we prayed/chanted a Divine Mercy Chaplet. I hadn’t mentioned this yet, but our group started a Divine Mercy Chaplet novena for the March for Life the week before we left on our pilgrimage, ending “tomorrow.” And because we hadn’t had the opportunity to pray it yet, we did so on the Metro. All in all, this was an action-packed day visiting the Monastery, the Poor Clares, and attending the Vigil Mass at the Basilica! I’ve never been to a monastery of this scale before, and I’ve never seen so many clergy gathered in one place (in person)! I’m grateful for these opportunities and experiences. And you know what? This is only half-way through my trip.